All the business of the 100th anniversary of the opening of a port memory hall of the 90th anniversary of the middle constituency system was finished. Thank you for your cooperation. We aim at Naka Ward of "uplift of Civic pride" (pride and attachment for Naka Ward) and "future intention". It becomes exalted for consciousness as middle inhabitant of a ward and breeds local love and collaboration, self-government awareness. As well as all of you, ward office of inhabitant of a ward, all groups, engines, companies, facilities in ward bless the constituency system 90th anniversary together and strengthen cooperation by being concerned with commemorative project. Children carrying the next generation have dream and hope in the future, and inhabitants of a ward imagine oneself and Naka Ward of ten years later (of the 100th anniversary of the constituency system) and take advantage to do step-up toward the future. We look back on history of opening of a port memory hall 100 years and stare at town with person who moved forward. It is important cultural property of country and blesses the 100th anniversary of the opening of a port memory hall which is Naka Ward public hall with inhabitants of a ward and realizes history of ward from the opening of a port period and charm, resources of ward again. We succeed to property which ancient people cultivated to children carrying the next generation and, for next 100 years, take advantage of the opening of a port memory Hall being important property of inhabitants of a ward to tell. Mascot character suuingi of Naka Ward was born at the time of constituency system 80th anniversary. 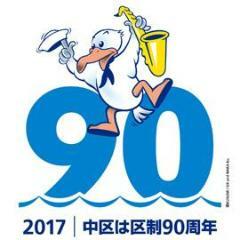 Logo mark of the 90th anniversary is suuingi jumping out towards the future. We update number by one year and, to the constituency system 99th anniversary, inflect.